I enjoy making new images for playkingdoms which reflect specific holidays and seasons around the world. 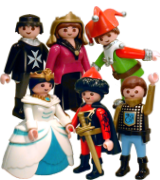 Some events are more challenging than others because the figures required to make scenes are not always available in playmobil® sets. Thanksgiving Day, the holiday which commemorates a feast held in 1621 by the Pilgrims and Wampanoag Indians (celebrated in October by Canadians and November by Americans), is a very good example of this. The symbolic image of Thanksgiving that immediately comes to mind, particularly after extensive googling ;), is the wild turkey. As everyone no doubt knows, playmobil® have not as yet produced this particular animal. (Fingers crossed that it is already on the drawing board or in the planning stages). I do like a challenge, and when I have the time, I also like playing around with the Milliput epoxy putty that my Just For Klicks web-partner David (warrensde) was kind enough to send me last year. :) That said, I decided it would be cool to have a go at creating my own playmobil®-style turkey using the Milliput and some enamel paints. 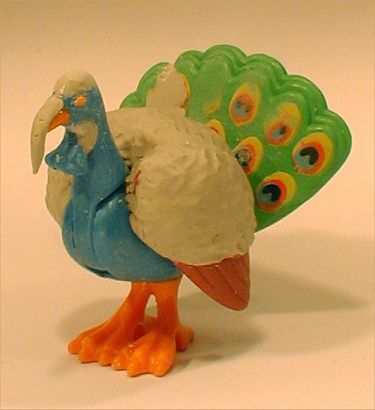 The basis, as many have already guessed - the tail, the feet and the name, "Perkey", are all big clues ;) - was a playmobil® peacock the same as that found in set 3894. Actually, it was two peacocks, because the tail needed to be slightly wider than the lowered, folded tail of one peacock. The plume from the head of the peacock was cut off and a section of it cut down to create the part of the turkey's wattle which sits on the neck. Once I had all the playmobil® parts cut to the shape and size I needed, I set about fattening my turkey with Milliput (a slightly unorthodox diet :p) and repositioning all the loose parts on the turkey's body. Most stayed in place until the Milliput set, but some needed the extra help of superglue to achieve adequate adherence. The tail was particularly problematic because of its weight. I also moulded a sliver of Milliput for the wattle on the beak. After the Milliput had set (the cooking process ;)), the final task was the basting-- er, I mean, painting the turkey. This was done twice because I was not satisfied with the first attempt. 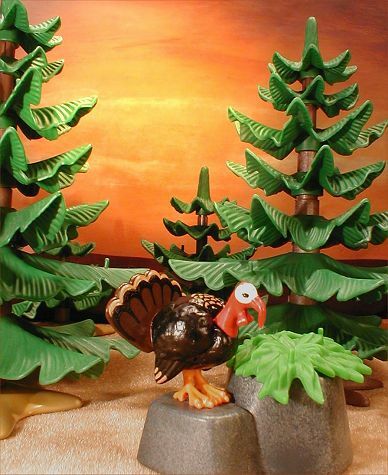 :( The difficulty was finding a style that sufficiently represented the colours and patterns of the turkey's plumage but remained simple enough that it was not vastly different to playmobil®'s own style of design. I decided to limit the body colours to black, dark brown, red, white and light tan (for the highlighted pattern). I left the turkey's feet unpainted, since I felt that playmobil® would not go to the trouble and expense of casting pink feet for just one species of bird when they already had millions of yellow ones (trying to mimic the thought processes of a playmobil® designer :p). I used Humbrol and Revell enamel model paints in a matt finish. Once dried, I added a layer of satin varnish to seal the paint. It appears slightly glossier on the photos than it does in real life, but this is partly due to the bright lighting used in my studio and my lack of a better camera. (A frustrated workman always blames his tools :p).